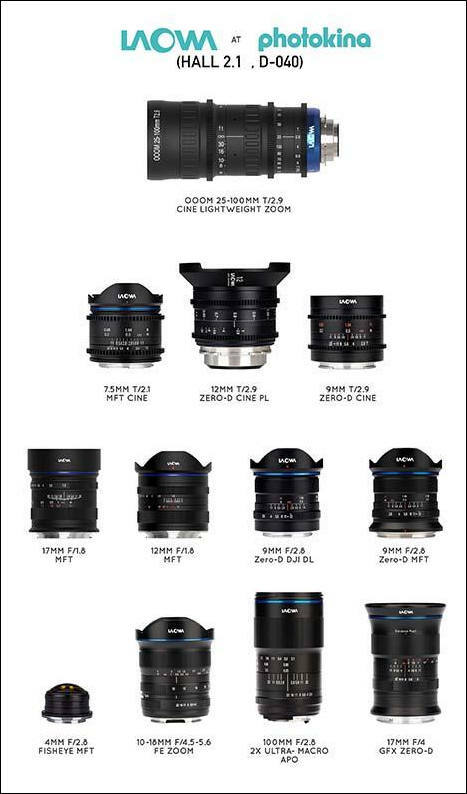 Venus Optics have unveil 8 new and unique Laowa lenses, including the 25-100 T/2.9 Professional Cine lens, the first professional cinema style zoom lens offered by the company. Together with the 4 new lenses showed earlier in Beijing P&E, a total of 12 new Laowa lenses will make their European debut at Photokina next week. All 12 new lenses will make their European debut in Venus Optics’ booth (Hall 2.1, D-040) at Photokina, Cologne during 26th-29th Sept. Pricing and ship date are to be confirmed. Anhui China, Sept 21, 2018 -- Venus Optics, the camera lenses manufacturer who had previously launched a number of unique Laowa camera lenses, is proud to unveil 8 new and unique lenses in Photokina. Laowa 17mm f/1.8 is a new compact, standard prime designed for Micro Four Thirds cameras and it gives a 35mm-equivalent field of view. The lens houses 9 elements in 7 groups and have a 5-blade aperture for the best sunstar rendering. The lens is extremely compact and lightweight, weighs only 160g (0.36lbs) and is 5cm (2") long. A 46cm filter thread is included and the 15cm minimal focus distance make it a perfect lens for videography. Laowa 12mm f/1.8 is a new compact, wide-angle prime for Micro Four Thirds cameras and it gives a 24mm-equivalent field of view. The ultra-fast f/1.8 aperture allows photographers to take astro photos with ease. The lens houses 13 elements in 10 groups and a 5-blade aperture. The lens can focus as close as 14cm (5.5") and takes 46mm screw-in filters which gives extra convenience to videographers. It weighs only 165g (0.4 lbs) and its 5cm long (2"). The new Laowa 12mm t/2.9 Zero-D Cine in PL mount is the cine-mod version of the existing 12mm f/2.8 Zero-D lens. The lens was rehoused with a step-less, t-stop aperture rings and focus rings with standard 0.8 mod gears for iris and focus pulls. It successfully covers the 35mm Vista Vision sensor size and offers an ultra-wide 122° angle of view, making it one of the world's widest and fastest available option for shooting with large sensors. Despite the ultra-wide field of view, it is perfectly rectilinear and features a close-to-zero distortion rate. The focus flow is extended to 270° for cinematographers to also take advantage of the 0.6 feet (18cm) closest focusing distance. The super lightweight (650g, 1.4lbs) is also an added benefit for cinematographers. This lens is currently the widest zoom lens available for Sony full frame E-mount cameras. Designed primarily for travel photography, Venus optics have managed to compress the size to smallest in its class, less than 4 inch (<10cm) and only 1.1 pounds (<500g). The 102° (18mm) to 130° (10mm) angle of view provides flexibility for photographers to compose landscape or architecture photos with ease. The lens houses with 14 elements in 10 groups with 2 aspherical elements & 1 extra-low dispersion element to deliver exceptional performance. It can focus as close as 15cm for some mini-macro shooting. A rear filter slot is included to fit with 37mm filter. A dedicated filter holder is being developed to fit 100mm-wide filters. Click/clickless aperture can be toggled by the switch on the lens barrel. A 5-blade aperture design ensures a pleasing and clean sunstar rendering.